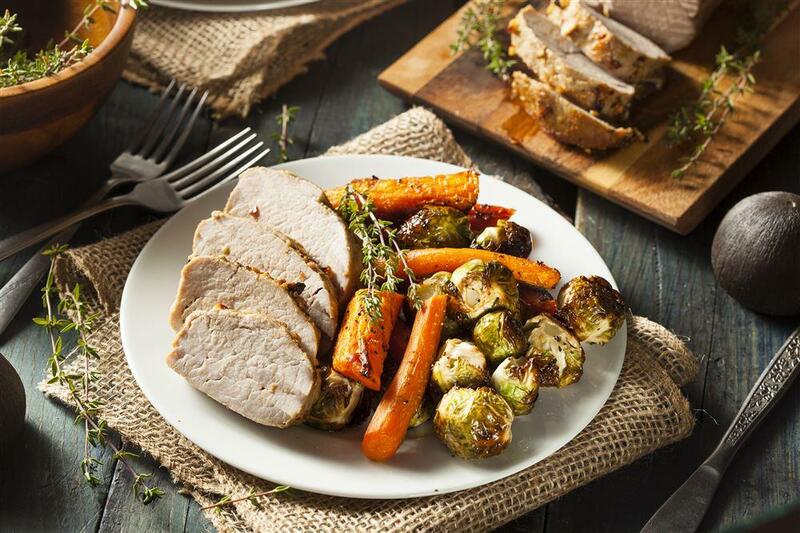 Time on High : 3 hours and 30 minutes Time on Low: 5 hours I love making pork tenderloin in the Crock-Pot® slow cooker. This month I happened to have a ton of root vegetables and some fresh rosemary from my garden so I decided to use them in a tasty pork tenderloin recipe. The flavors played off of each other so well and even my little ones ate their vegetables. 1. Place onions, carrot,s and potatoes in a medium sized bowl. 2. Sprinkle with olive oil, Parmesan, half of the rosemary, an garlic. Add salt and pepper to taste. 3. Toss to coat all vegetables well. 4. Place coated vegetables in the Crock-Pot® slow cooker. 5. Combine parsley, onion powder, garlic powder, remaining rosemary and seasoned salt in a small bowl to create the rub. 6. Rub pork tenderloin with seasonings. 7. Add vegetable oil to a skillet over high heat. Oil is hot enough once it starts to ripple. Add pork tenderloin and sear for 1 to 2 minutes per side. 8. Keep the pan hot while you place seared tenderloin over top vegetables in the Crock-Pot® slow cooker. 9. Pour beef broth in hot skillet to deglaze, scraping up any brown bits. Pour juice in the Crock-Pot® slow cooker. 10. Cover; cook on High for 3 hours and 30 minutes or on Low for 5 hours, or until pork tenderloin is cooked through and the vegetables are softened to your liking. 11. Once done cooking, place pork on a serving platter and let sit (covered) for 10 minutes before cutting. 12. Slice and serve with vegetables from Crock-Pot® slow cooker. I followed the recipe exactly as written. Everything turn out fabulous. Meat was not dry. Vegetables were delicious. We will definitely make this again. The flavors are delicious! I, too, lessened rosemary amount. Sautéed garlic cloves and onions in pan before searing pork then added beef bouillon to pan to grab all flavor from pan and poured over pork in crockpot. Maybe that’s how my roast overcooked. I only seared pork for less than 3 mins to get all sides. I was following the 5 hrs on Low per recipe which only used a 1 1/2 lbs pork. When I checked it after 3 hrs on Low, it was already too late, darn. I will definitely try again. Thanks for sharing. Tried this tonight. I only cooked it for three hours but seemed like that was too long as the pork was very dry. The potatoes need more direction. I cut them up and they cooked through mostly but three potatoes seemed like too much and 9bky 1 cup of baby carrots ? Too much rosemary and I like rosemary. Needs other seasonings as well. Just over all needs to be tweaked. I am not a big fan of rosemary so, I substituted with fresh thyme and added a pinch of rosemary. I also had no beef stock on hand, again substituted with an un-oaked Chardonnay. Which I think worked well with the flavor profile. This was a great meal! I served it with Parmesan risotto, in addition to the veggies. I believe recipes are a catalyst to your own food preferences. This was easily manipulated to please my family of 4. I will definitely make it again!! Thanks for the wonderful idea. This recipe comes out perfectly!! I wouldn’t change a thing. Soooo tasteful and delicious. One of our favorite meals!! Tired the recipe and it has too much rosemary and not enough other spices. I would not use this recipe again. Made this last night!! Everyone loved it!! Going to put this in the monthly rotation! This sounds delicious and I bought all the ingredients to make it today but I'm stumped. The ingredients list includes 3 potatoes, not peeled. The instructions don't mention the potatoes other than to put them in the crock pot--do they go in whole? I've never put whole potatoes in a crock pot so I appreciate clarification. Also, the picture shows brussel sprouts but no potatoes...I looked to see if I could figure out how the potatoes are prepped! Thanks for your help. This was so flavorful! Will make this again! Searched several sites for a delicious sounding pork roast recipe that would also accommodate our gluten free diet. I have fixed this recipe 3 times so far and we LOVE it. Can't believe no one else has reviewed this before. I used a pork roast the first two times and am making it today with thick cut loin chops which I had in the freezer, I'm sure it will turn out great too. I don't use fresh herbs (too hard to find or keep from spoiling) in mine but the bottled ones and squeeze garlic (in a bottle or tube) work great! I also add double the vegetables as we like lots of leftovers with the juices. I fix packages black beans and rice as a side and pour some of the pork juices on top, MMMMMMMMMMMMMM, what a meal!